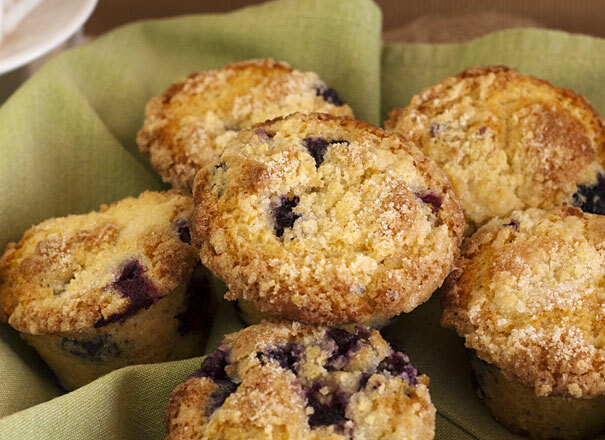 These blueberry muffins are really quick and easy to make. I put them together in under 10 minutes and I sifted the dry ingredients. Preheat oven to 400 degrees F (200 degrees C) and grease muffin tin or use paper liners. Combine 1½ cups flour, ¾ cup sugar, salt and baking powder in a bowl and whisk to mix. In a 1-cup measuring cup, add vegetable oil, the egg and enough milk to fill the cup. Lightly mix to break the egg. Add the wet ingredients to the dry ingredients and mix til nearly all the flour is combined. Add blueberries and fold them into the batter. In a medium sized bowl, mix together ½ cup sugar, ⅓ cup flour, ¼ cup butter, and the lemon zest. Mix with fork, and sprinkle generously over muffins before baking.